The Davallia genus of ferns includes about three dozen species of ferns that all share a quirky and kind of delightful trait: they all grow from creeping rhizomes that are fuzzy and covered with a fine fur-like mat of hairs. This fuzzy rhizome has earned the Davallia species their common names: deer's foot ferns, squirrel's foot ferns and rabbit's foot fern, among others. The idea is that the fuzzy, ground-level rhizomes resemble animal feet. In their native habitat, these ferns are often epiphytic, which explains their creeping rhizomes. In indoor cultivation, they are frequently grown as hanging plants or long-term potted plants. Although the rhizomes do extend below the surface of the soil, they should never be buried. These roots serve something of the same function as orchid roots. They cling to surfaces and draw moisture and nutrients from the air and environment. Instead, let the rhizomes grow uncontrolled until they cascade from the container and add a cool visual note to your fern. These are shade-loving or at the very least shade-tolerant plants. Indoors, a north-facing or east-facing window would be ideal. Never expose them to direct sunlight unless they've been carefully acclimated. They can also be grown well under artificial lights. These ferns love humidity and will require both frequent watering and frequent misting. It's important not to let the rhizomes dry out, which will weaken and possibly kill the plants. The best-looking plants are grown in conditions similar to many Ivies. They like a loamy, rich soil with plenty of peat. Drainage is not a paramount concern (although they dislike being water-logged). Along with clumping ferns, the Davallia are relatively easy to propagate. 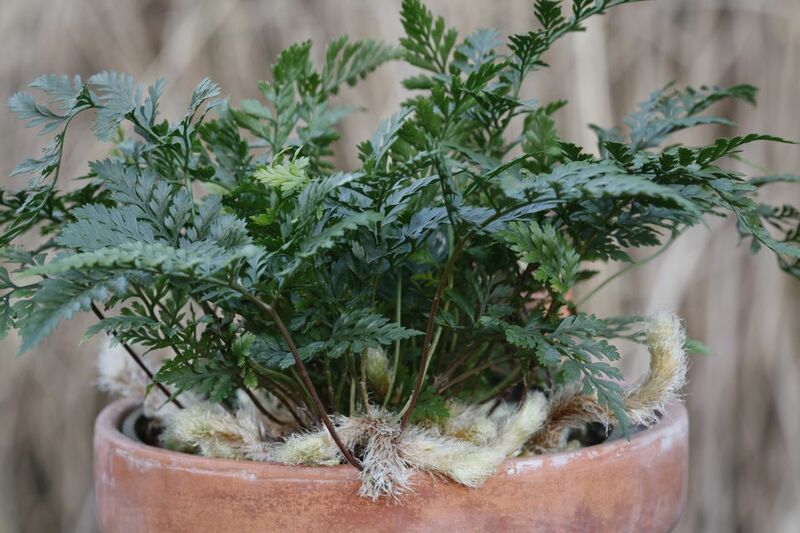 You can propagate from spores, but it's just as easy to divide the underground rhizome and split your fern in two, potting up each half into a new container. It's best to perform this operation on older plants so you can get the most viable rhizome possible. These do not need frequent repotting and in fact should be encouraged to overgrow their pots a little bit. This is especially true for hanging plants, which look better when they cascade slightly and their unique rhizomes are visible protruding from the container. For best growth, repot every other year. The Davallia genus is interesting throughout but unfortunately, only a few species are regularly found in cultivation. These include the deer's foot fern (D. canariensis), the squirrel's foot fern (D. trichomanoides) and the rabbit's foot fern (D. fejeenis). Most of the species stay relatively small with triangular fronds that measure about 12 to 18 inches in length and have airy, feathery foliage. The more delicate varieties require more water than their thicker cousins. Growing these plants well requires a somewhat careful touch. They have to be given ample water to thrive, including daily misting of the rhizome or a really humid room. But they also do best when certain common things — like repotting and heavy fertilizing — are neglected a little bit. In general, they dislike being disturbed much and once you've found a good home for one, it will not react well to changing conditions. Also be aware that these plants are very sensitive to accumulated fertilizer salts, in part because of their rhizomes. Make sure to flush the soil very well at least once a year and even soak the root ball to clean out fertilizer. Grow them in mossy baskets for a truly prehistoric look. Davallia are vulnerable to pests including aphids, mealy bugs, scale and whitefly. If possible, identify the infestation as early as possible and treat with the least toxic option.